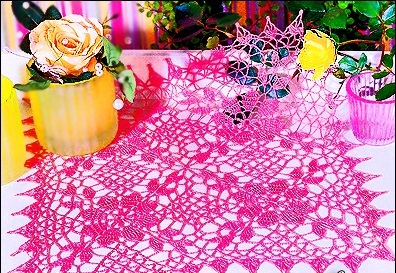 In this interesting occupation, knitting crochet napkins addicted for a long time, there was even time, when it was not at home, which was not found to be at least one such product. And it is not surprising because these cute little things can become a decoration of any, even the most refined interior. 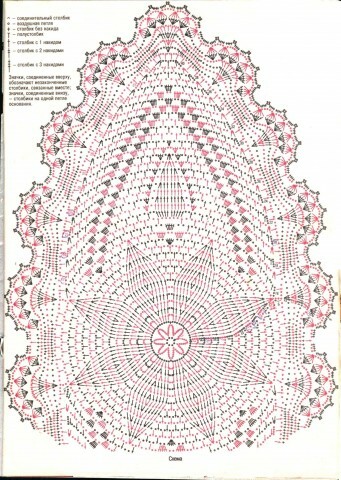 technology, allowing crochet napkins of great beauty great many, and drawings and schemes with even more. It may be napkins in the shape of a flower, round oval, square, rectangular and even triangular shape, related form of a flower or assembled from different parts. therefore, if you suddenly have a desire to create their own little thing like, the scope for choice is almost limitless, besides, you can always connect to your own imagination process. Begin to knit better with the easiest schemes and only gradually moving on to more complex patterns. To swipe obtained graceful and delicate thread, usually, They come from the most subtle. An excellent choice for the product is made of natural cotton yarns without additives, and iris. A hook is selected depending on the chosen yarn thickness, usually its diameter must be 1,5-2,5 times thicker than the filament diameter. Each selected scheme requires careful analysis, before the work. In order to link the product to straighten, it can simply be wet, then spread and dried to leave. After which it was gently through the cloth ironed iron. If desired,, damp cloth can be put under the press, or starch. 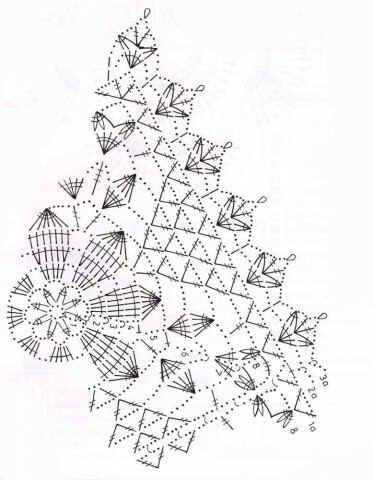 Before the beginning of knitting may also be trained in causing more complex patterns of elements. To begin with, we offer the following very nice tie, but by a simple napkin. 1 p. Make a moving loop, and then two air lift loop. The moving loop provyazyvaem 11 loops with one sc-loop and tighten the circle. 3row. do 3 loop for lifting a number, then, starting with the first loop, provyazyvaem follows the previous row: 2 column with sc in one loop, 1 column, without sc, 2 column, without sc in one loop, and so on until the end of the series. At the end of the connecting bar again doing. 4 number as well as the third provyazyvaetsya. 5 row. Three lifting loop, 1 column, without sc,*2 air hinges, 2 column with sc in one loop of the previous row, two columns of the previous row and the third skipping get involved 2 column with sc, then, starting with an asterisk knitting is repeated until the end of the series. The final step in creating napkins, coasters is the design of it with embroidery. To do this, take the thread of any other color, in this case the selected Green, the hook is threaded into one of the loops of the fourth series, from right to left, grab a new thread and pull it, forming a loop, whereupon vdevaem hook in next loop, grab the working yarn and a new loop is knitted, thus pigtail provyazyvaetsya of the loops around to the end of the series. The final stage is to secure the thread with a needle. Knitting starts with a circle, created from the chain, consisting of 12 stitches. At the beginning of each row is three lifting loops, and in the completion of the connecting bar. 1p. Four times repeated action: 5 columns with sc(Article. s / n) crowding round, then made 3 air hinges(pp). 2p. 2 Article. s / n in the arch, 3 pp, 3 Article. s / n in the arch, 5 pp, then 3 times repeat: 3 Article. s / n in the arch, 3 pp, 3 Article. s / n in the arch. 3p. 2 Article. s / n in in verse. s / n of the previous row,3 Article. s / n in the arch, 3 pp, 3 Article. s / n in the arch, 3 Article. s / n in verse. s / n of the previous row , then 3 times repeated rapport: 3 pp, 1 st b / n for a long, 3 pp, 3 Article. s / n in the columns of the previous row, 3 Article. s / n for long, 3 pp, 3 Article. s / n for long, 3 Article. s / n in the columns of the previous row. 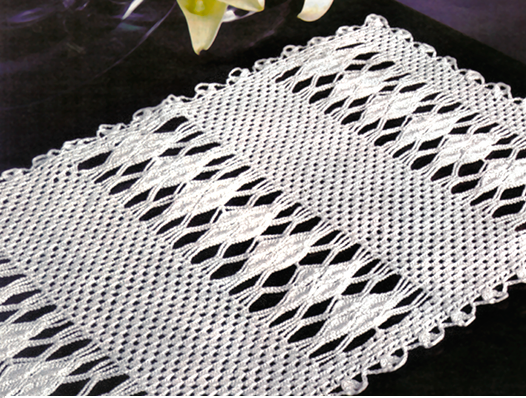 This gentle oval napkin, crocheted in the art openwork knit obtained in width size 28 cm, and at length 70. It is for this model are taken iris white thread and a hook with №1,5. Napkin created in several stages. First is knitted according to the scheme given below, its center, whereupon the lateral sides are made and finally processing edging. 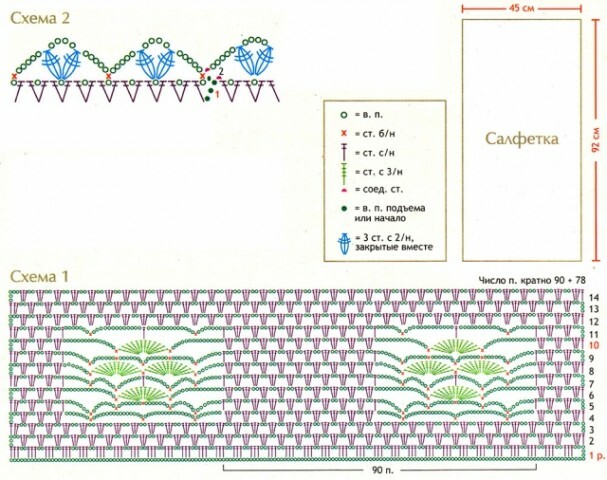 The central part of the ring starts with eight stitches and knitted in accordance with the scheme 1 by 15 row, and since 16 a number of 40 number in the diagram indicated by the lateral part, which is knitted with one hand, and then the other. Framing of the product is marked on the chart with 41 of the last row. Volumetric napkins look not only extraordinarily beautiful, but also very original. Consider a couple of examples of such veshchichek. First flower vyvyazyvayut seredinku. To do this, we take the yellow thread and make a circle of four stitches, interconnected polustolbikom. In the first row in a circle provyazyvaem 8 columns without sc. In the second row is replaced with black and yellow yarn provyazyvaem in each column of the previous row 2 column, without sc. 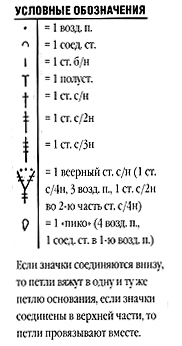 The third row has a red thread provyazyvaem follows: do 1 column, without sc, 4 air hinges, skip 2 and the third column provyazyvaem 1 column, without sc., in the same way provyazyvaem three arcs. 2 p. do 1 st b / n, 1 Article. s / n, in the following 3 provyazyvaem hinges on 2 Article. s / n, 1 Article. s / n, 1 st b / n.
3p. In each column of the previous row is done by 2 Article. s / n.
5 p. Binds entire petal item b / n and the first element is ready. Then in the same manner provyazyvaem remaining three petals. Then we collect the flower buds in a beautiful and secure them with the help of needles or hooks. Such flowers for future product must be prepared for another seven pieces. 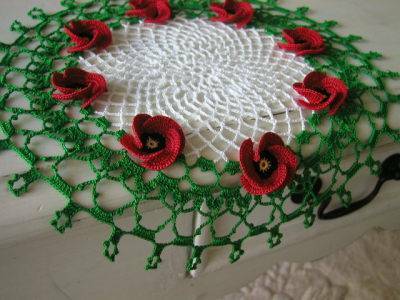 In the final stage of manufacturing bulk tissue, hooked, attach to poppies napkin, in the first row, related threads of green. With the help of the following video you can make three-dimensional tissue-flower, which can be decorated, eg, jar with spices. For such thin napkins must prepare a hook with a diameter of 1.5 mm, as well as about 150 – 200 g. white threads of cotton, desirable mercerized. color thread, if desired, possible to change and take, eg, beige or blue tint, Based on, it is more appropriate to your decor. The size of the resulting product will be equal to 92 cm long and 45 cm width. 1p. do 3 air hinges(pp) to raise the number of, then another 2 for drawing. Then in the beginning with the third eyelet chain, to get involved in the following three one pillar of the loop with two sc, then re-do 2 Air loops and three loops chain vyvyazyvayut successively with three column nakida(Article. s / n), thus knitting is repeated until the end of the row. 2-3p In the beginning of the series do 5 pp. (3 Lifting and two for the pattern), then in the arc of the two air loops, previous row, provyazyvaem 3 Article. 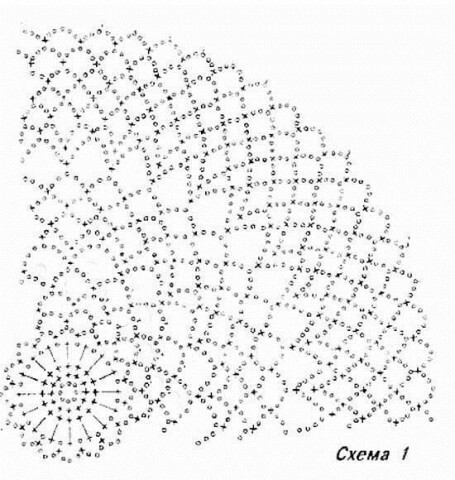 s / n, do 2 ce and again in an arc provyazyvaem 3 Article. 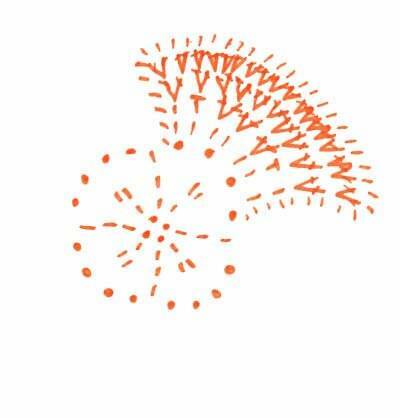 s / n. Knitting is repeated until the end of the series and ends with knitting 1 Article. s / n to a third lifting loop, previous row. 4p. Three lifting eyes at the beginning of a number plus 2 pp. picture, in each of the two subsequent arcs to get involved 3 Article. s / n, then 2 pp. After that the mesh pattern start vyvyazyvayut. *For this is knitted from the following arc 3 Article. s / n , and then recruit 7 ce and fix them in the next column connecting through a single arc of air loops, recruit 15 pp. and anchoring them in an arc connecting column, previously missed two and then typing 15 pp, We do polustolbik two arcs. In the next step we collect 7 pp. and through one arch perform 3 Article. s / n and type 2 pct *, after which each of the following seven arcs to get involved three st. s / n, 2 pp, Then, the picture again, how described from * to *, in the completion of a number again in each arc is typed 3 Article. s / n i 2 pp, and at the very end of the series 1 Article. s / n to a third lifting loop of the previous row. 5p. At the beginning of the series do 5 stitches, three of them to lift, then knitting is performed in the following sequence:*3 Article. s / n in the arch, 2 VP, 3 st. s / n in the arch, 2 pp, 1 Article. s / n to the top of the arc of seven ce, 7 pp. anchoring connective loop fastener in place of the previous series of arcs, 7 pp, coupling a column to the middle of the next arc, 14 pp, the connecting bar of the arc, 7 pp. anchoring connective loop fastener in place of the previous series of arcs,7 pp, 1 Article. a / n for thread Dugi,2 pp, 3 Article. s / n in the arch, 2 pp, 3 Article. s / n in the arch, 2 pp * in the following 4 arc provyazyvaem 3 Article. s / n, 2 pp, then repeat rapport *, and concludes with a series of do 3 Article. s / n in the last arc. 6p. 3 lifting loop, 2 pp,*3Article. s / n for long, 2 pp, 3Article. s / n for long, 2 pp, 3Article. s / n for long, 15 pp, 1 v b / n in place arcs compound, 6 Article. 3 / n, 1 st b / n in the middle of the arc, 6 Article. 3 / n, 1 v b / n in place arcs compound, 15 pp, in the next three arc 3st. s / n for long 2 pp,* and over the next three arc 3st. s / n for long 2 pp, then repeat the report, marked *, and at the end of a number of do 1 v b / n in the third loop lift, previous row. 7p. This series provyazyvaetsya the fifth, the only difference in the report, instead 14 stitches large arc, provyazyvaetsya: 7 pp, 1 Article. s / n in 1 st b / n the previous row, 7 pp. 8p. 3 lifting loop, *2 pp, 3Article. s / n for long, 2 pp, 3Article. s / n for long, 2 pp, 3Article. s / n for long, 7 pp, 1 v b / n in place arcs compound, 12 Article. 3 / n in the following compound arcs, 1 v w / v in the connector. s / n of the previous row, 12 Article. 3 / n in the following compound arcs, 1 v b / n in the connector item b / n, 7 pp, in the following two arc 3st. s / n for long 2 pp, 3 Article. s / n,* in the following 3 arc 2 pp, 3Article. s / n for long, then again we are knitted on a number of report, concluded in *, at the end of doing st. s / n in the lifting loop of the previous row. 9p. This series is repeated as the fifth and ninth, except figure report, where the arc start vyvyazyvayut, from this point knit by the following scheme: *7 pp, 1 st b / n fo. b / n the previous row, 7pp, 1 st b / n between 6 and 7 Article. 3 / n the previous row * ,then enclosed in action * repeated. Then mated with repeated 4 by 11 row, and the last three final tally as the number of salfet 2 row. 1p start from the arc, located near the corner of the product. do 3 lifting loop, then to the end of the row provyazyvaem columns in the following order: Article. s / n in the arch, 1 pp, Article. s / n in the same arc, completed a series of connecting column. Napkins rectangular really look good on coffee table, and select the size of the scheme more than, one can associate a tablecloth. napkins knitting machinery of the reasons lies in knitting each element alternately, and a serial connection with a hook or a needle. 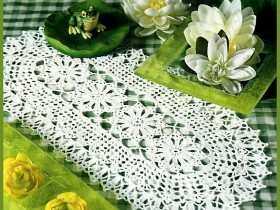 napkins, crochet from motifs, They can fit in both of the larger elements, and from small. But most of all parts of the product are not big motives, which is circular in shape, square or triangular, as well as, eg, butterflies, hearts or flowers. We offer to your attention a square napkin, related to four parts and the size of each of the parties 41 cm. 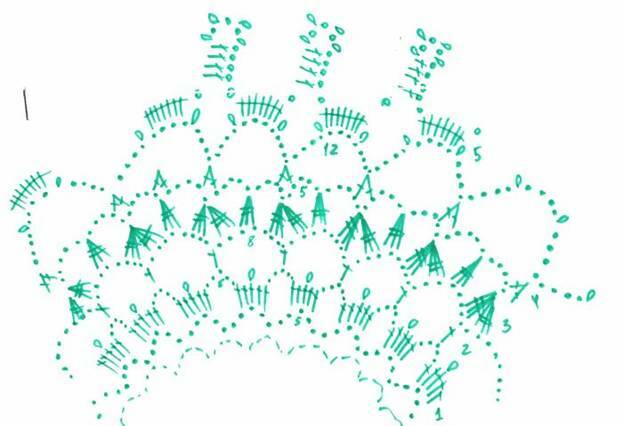 Once all the pieces are knit, they must be connected to a needle, and then tie on the edge of three rows, as shown in Scheme, since a number of 1a. As you have to make sure to crochet napkins are not so difficult, To do this, just to gain some experience and learn how to read circuit, who came up with a great many.